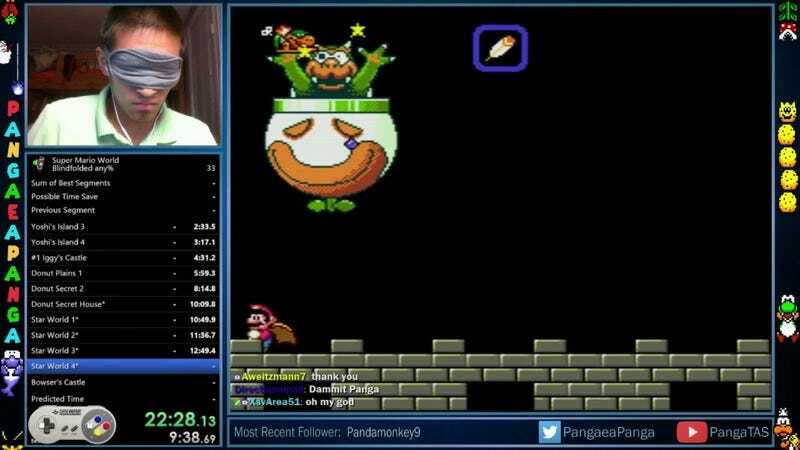 Well, you can add “speedrunning through Super Mario World while blindfolded,” to the list of things you never thought to even try, but definitely couldn’t do. Twitch user Pangaeapanga crossed that item off his list when he completed an epic romp across all of the worlds necessary to complete the game. The run wasn’t perfect; Pangaeapanga died a few times and even got lost. Despite those setbacks, he still managed to reach the Princess in under 23 minutes. Of course, cheating isn’t unheard of in the realm of speedrunning, and he potentially speedran the course sighted, but rehearsing all of those reactions, and convincingly syncing them seems way more challenging and unpleasant than just playing video games blindfolded for half an hour. If you’re thinking that this kid must have wasted years of his life getting good enough to pull this off, Pangaeapanga humblebrags in the video description that he only started playing blindfolded on June 16, a mere week before savaging Mario World Daredevil-style.